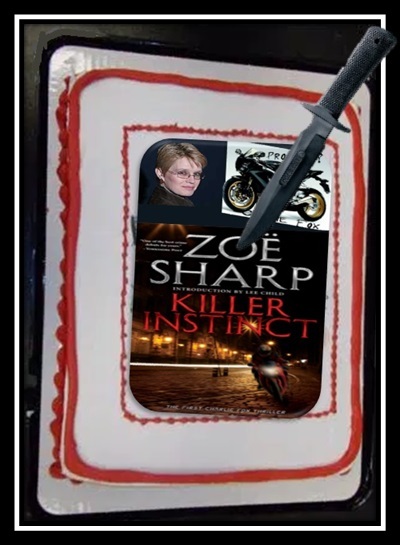 Great Moments in "Staking the Cake"
Thanks to our good British friend, Zoe Sharp, a Murder Among Friends (MAF) tradition began with her first visit to our fair library: Staking the Cake! 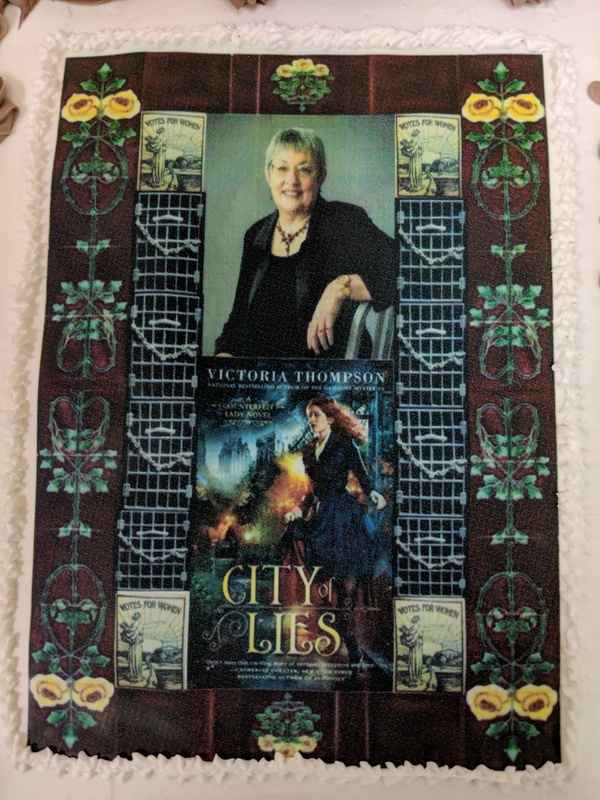 When authors come to visit, we like to do special things, and one of them is to get a custom cake made (at our fine local Jewel) that has a design that includes the author and their book's cover. When Zoe came to visit, she was kind enough to demonstrate some self-defense moves, so we arranged to have a (plastic!!) military knife for our “perp” to use against Zoe. 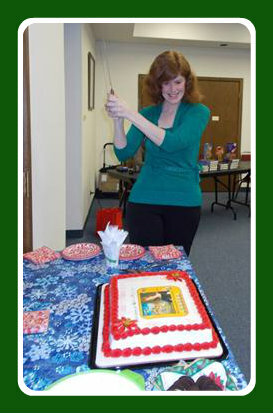 Zoe in turn, used the knife to pretend-cut the cake we made for her! 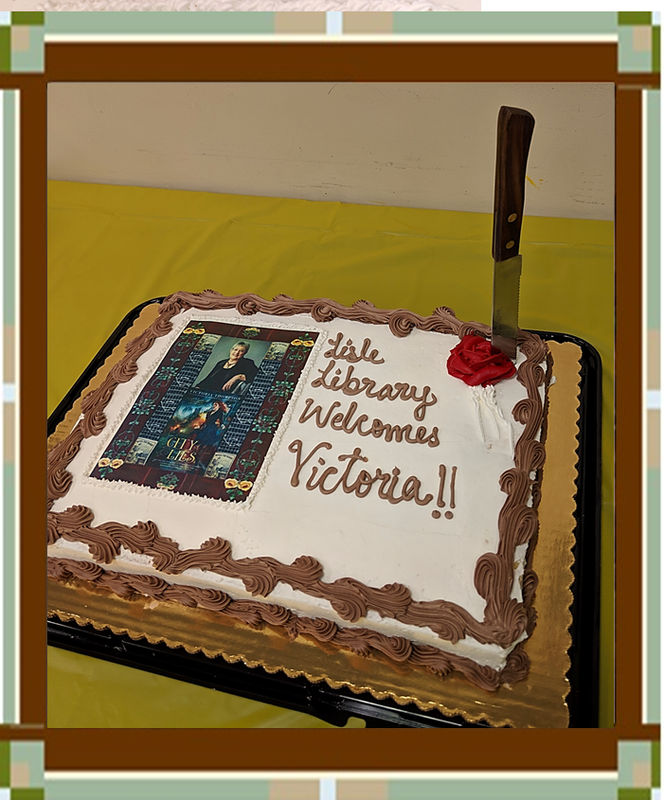 So many people got a kick out of this, that we started offering the photo opportunity to “stake the cake” to all subsequent authors who’ve spent time here with the group. 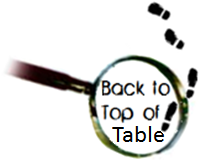 Our eager Cake Stakers have grown over time, so here's a table to link directly to a specific author's Staking experience! 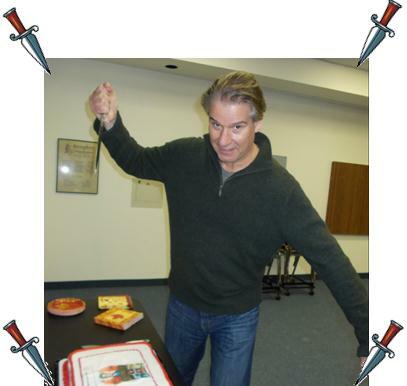 he let loose his inner cake stabber! 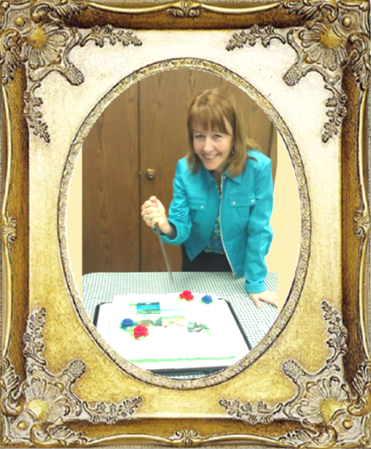 Julie Hyzy shows us how a White House Chef might Stake the Cake. 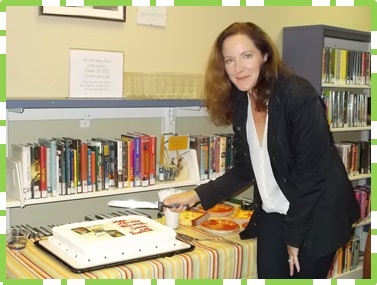 Joelle Charbonneau didn’t skate around the stake – but plunged it straight into the cake. 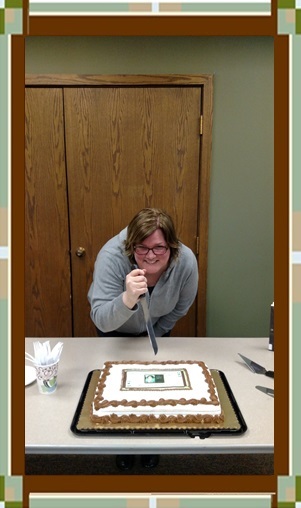 Jamie Freveletti doesn’t just know aikido – she stakes cakes very efficiently as well. 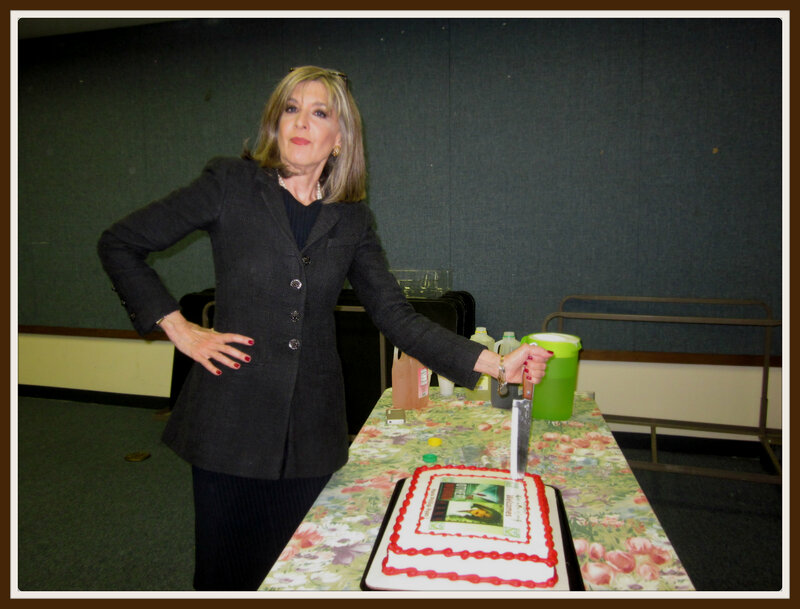 Hank Phillippi Ryan showed us a “veddy proper” way to Stake One’s Cake. 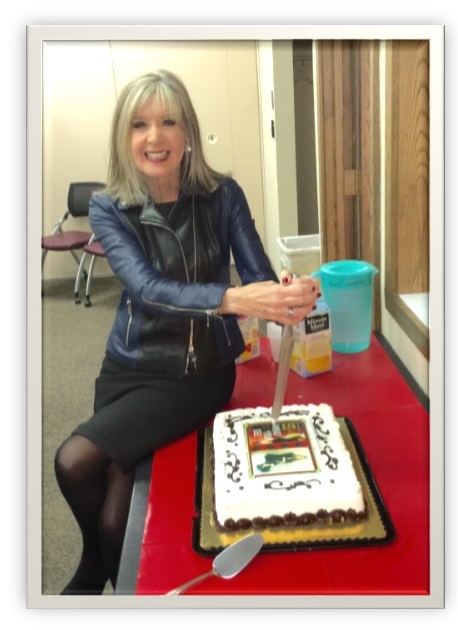 Lori Rader-Day takes 2016's first stab at Staking the Cake! 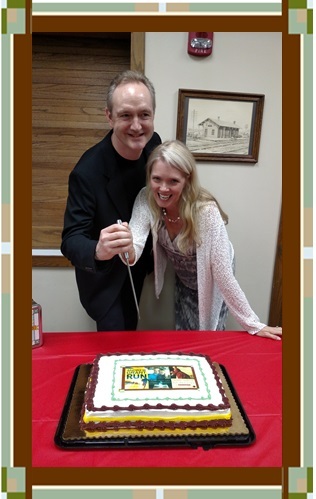 Tasha Alexander & Andrew Grant Join Forces as Our First Couple to "Stake the Cake"! Everyone enjoyed that so much, but as Andrew pointed out - they hadn't actually driven the point (of the knife) home, so each of them took a shot at it. 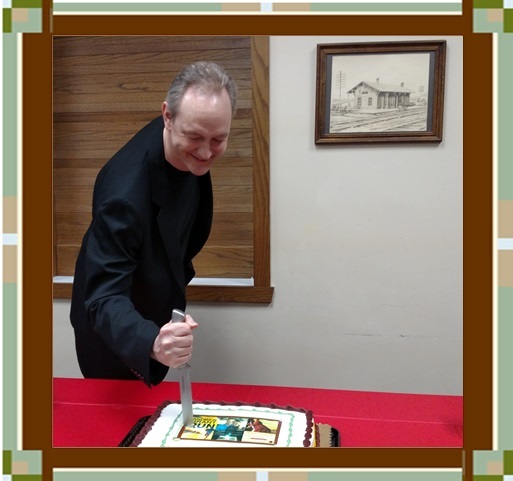 Robert Goldsborough was on hand at our Sept. 22nd meeting to help us explore the world of Nero Wolfe and Archie Goodwin, as well as learn more about their (other!) author, mystery legend, Rex Stout. 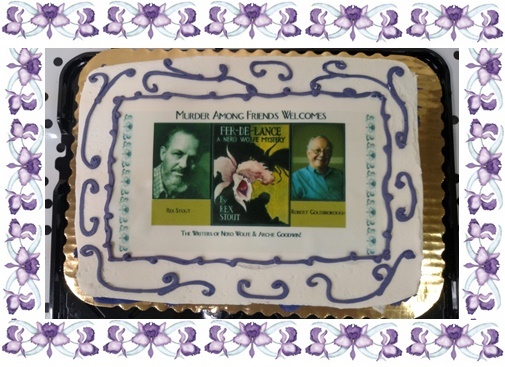 We felt it was only fitting that as Bob also writes further adventures for Wolfe and Archie, that we invite him to Stake the Cake that pictured both authors with the Fer-de-Lance cover. 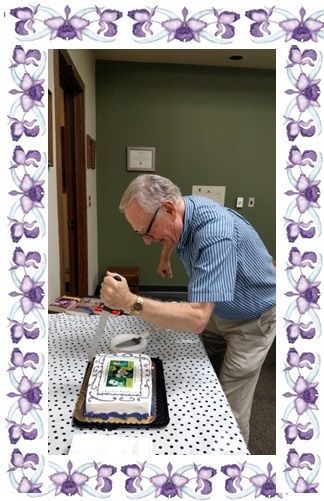 and here's Bob's jubilant attack on it! 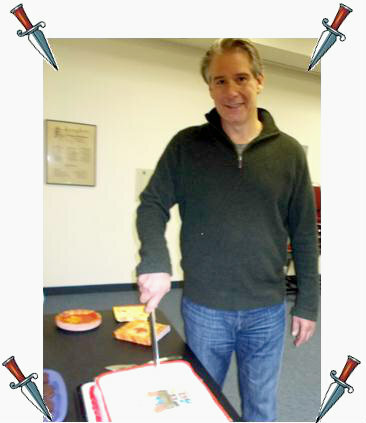 And here's our wonderful Hank in 2017, completing the Stake-the-Cake Trifecta! 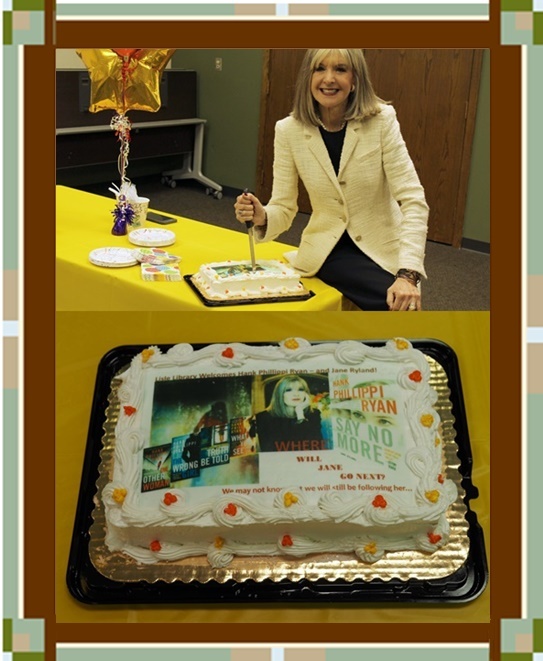 And celebrating not only her visit with us, but her 34th (!!!!) Emmy! 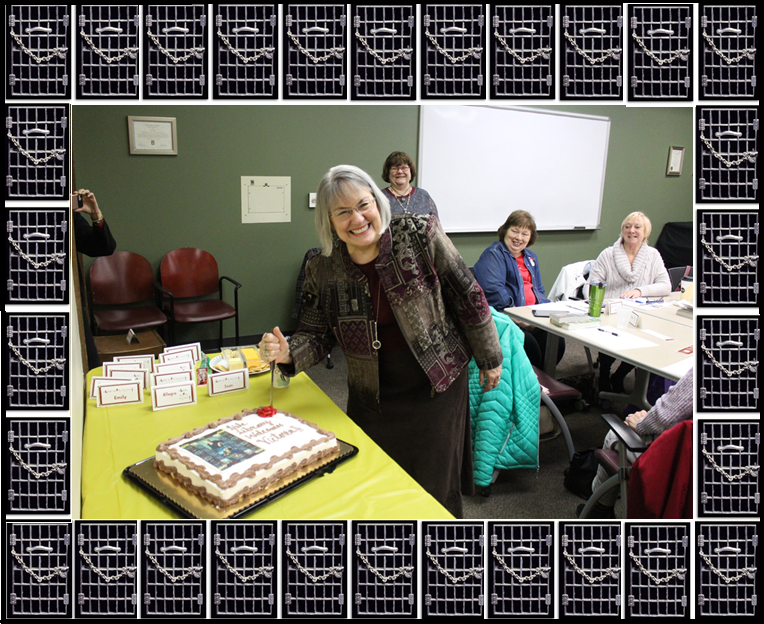 Susan M. Boyer offered a blithesome take on the "Steel Magnolia" in staking her cake. 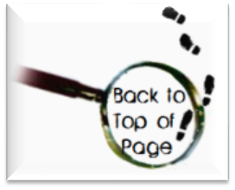 P.I Liz Talbot would have been proud of her! 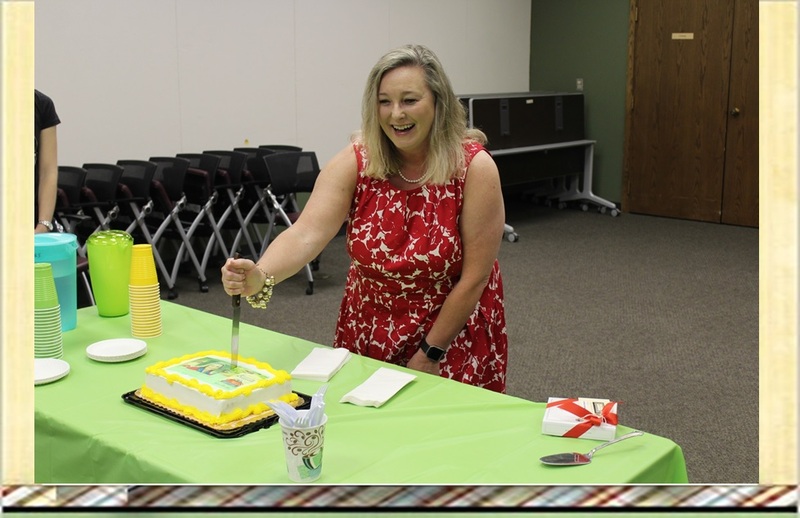 Victoria Thompson provided another historic moment -- which was highly appropriate considering the historic content of her Suffrage-based story! and here's a close-up on her design, which included the yellow roses supporting suffrage, and the one red rose (stake target!) that opposed suffrage. The silver gates border is made up of the silver pin design that those who survived the horrors of the workhouse and forced feeding sessions were given by the National Women's Party in 1917. 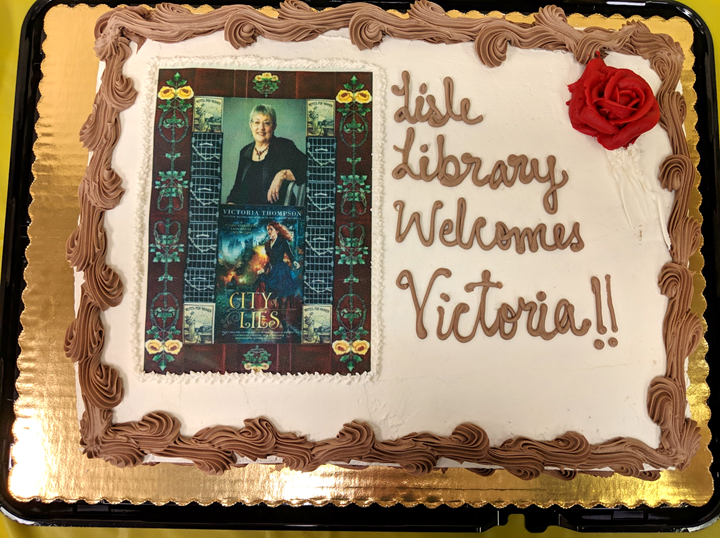 Kudos to Vicki for a job well-done!